There were quite a few monthly reports of note released this past week. Fueled by gas prices, September prices increased 0.6%. 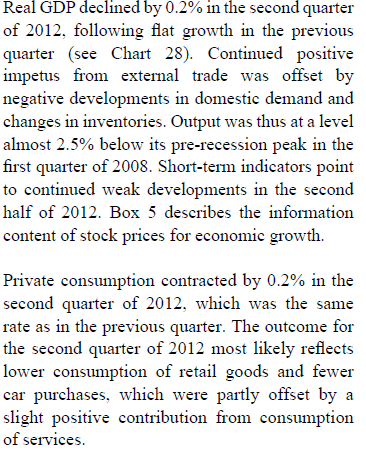 But consumers outsepnt even that, as retail sales increased 1.1%. Industrial production rebounded slightly, but August's cliff-dive was revised even further downward. The Empire State and Philly Fed reports averaged zero growth. Existing home sales edged down from August's post-recession high. But housing starts and permits both rocketed to new post-recession highs, helping the Index of Leading Indicators rise 0.6, although August was revised down to -0.4. 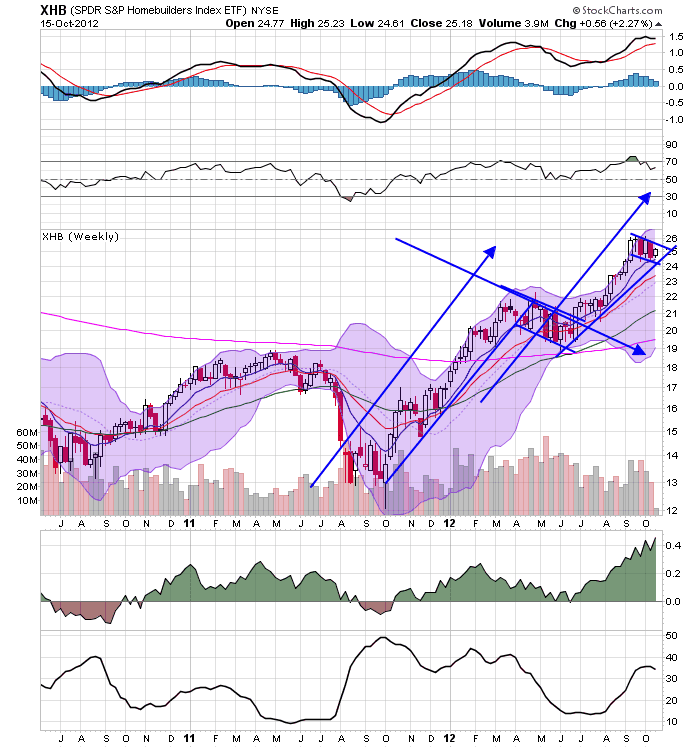 A reminder: I watch high frequency weekly indicators not because they lead the economy, but because they are a snapshot of the virtual present, as opposed to looking in the rear view mirror. While there is plenty of noise, they should show turns or continuations in a trend before they show up in monthly or quarterly data. 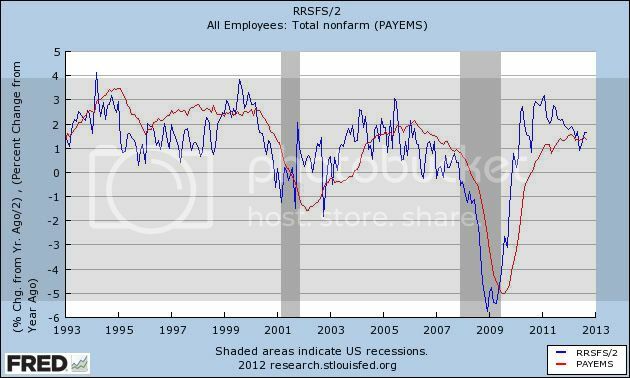 Let's start with Employment related indicators, which resolved last week's big surprise. The Department of Labor reported that Initial jobless claims rose 49,000 from last week's unrevised 339,000 to 388,000. The four week average fell 1,500 to 365,500, less than 1% above its post-recession low. Averaging the last two weeks' numbers is clearly the correct thing to do. The American Staffing Association Index was again level at 95. The index is equal to its high reading for the year. The trend in this index is simialr to last year. The Daily Treasury Statement showed that 13 days into Ocotber, $97.2 B was collected vs. $ 93.2 B a year ago, a $4.0 B increase. For the last 20 days ending on Thursday, $132.8 B was collected vs. $127.3 B for the comparable period in 2011, a gain of $5.5 B or 4.2%. The YoY comparison in tax collections has improved markedly since midyear. The ICSC reported that same store sales for the week ending October12 were unchanged w/w but were up +2.7% YoY. Johnson Redbook reported a weak 1.8% YoY gain. Johnson Redbook has consistently been lower than the other series for consumer spending. The 14 day average of Gallup daily consumer spending as of October 18 was $70, compared with $69 last year for this period. This is only the third time in the last 13 weeks that Gallup's YoY comparison has not been strongly positive. Weekly BAA commercial bond rates fell .09% to 4.60%. Yields on 10 year treasury bonds, however, rose .04% to 1.71%. The credit spread between the two decreased to 2.89 %, a new 15 month low. This continues an excellent trend, as it demonstrates a lack of fear of corporate default. The Mortgage Bankers' Association reported that the seasonally adjusted Purchase Index rose 1% from the prior week, and is up 12% YoY. These are now back near the top end of their 2+ year range. The Refinance Index fell -5% for the week, retreating from recent multi-year highs. The Federal Reserve Bank's weekly H8 report of real estate loans this week increased .01% to 3538. The YoY comparison decreased to +1.3%, and is 1.7% above its bottom. YoY weekly median asking house prices from 54 metropolitan areas at Housing Tracker were again up +2.2% from a year ago. YoY asking prices have been positive for 10 1/2 months. M1 gained +1.8% for the week, but was off -1.6% month over month. Its YoY growth rate rose slightly to 10.6%. 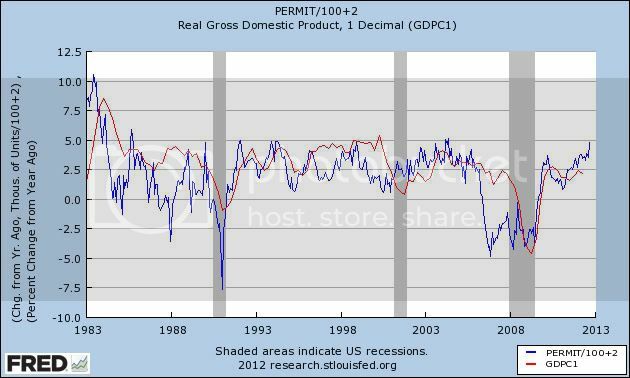 As a result, Real M1 also rose to +8.9% YoY. M2 fell -0.1% for the week, but was up 1.0% month over month. Its YoY growth rate also rose slightly to 7.1%, so Real M2 also rose slightly to 5.4%. The growth rate for real money supply is still quite positive. The American Association of Railroads reported that total rail traffic was down -2.2% YoY. Non-intermodal rail carloads were again off a huge -6.1% YoY or -18,600, once again entirely due to coal hauling which was off -22,900. Excluding coal, carloads were actually up +12,100. Negative comparisons declined to 10 to 8 types of carloads. Intermodal traffic was up 6,400 or +2.6% YoY. Gasoline prices fell $.03 last week to $3.82. This is still very high and bodes ill for the impact of energy prices on the economy next spring. Oil prices per barrel declined slightly from $91.66 to $90.05. Gasoline usage turned positive this week on a YoY basis. For one week, it was 8729 M gallons vs. 8598 M a year ago, up +1.5%. The 4 week average at 8680 M vs. 8883 M one year ago, was down -2.3%. The 4 week YoY decline is on top of the YoY decline last autumn. 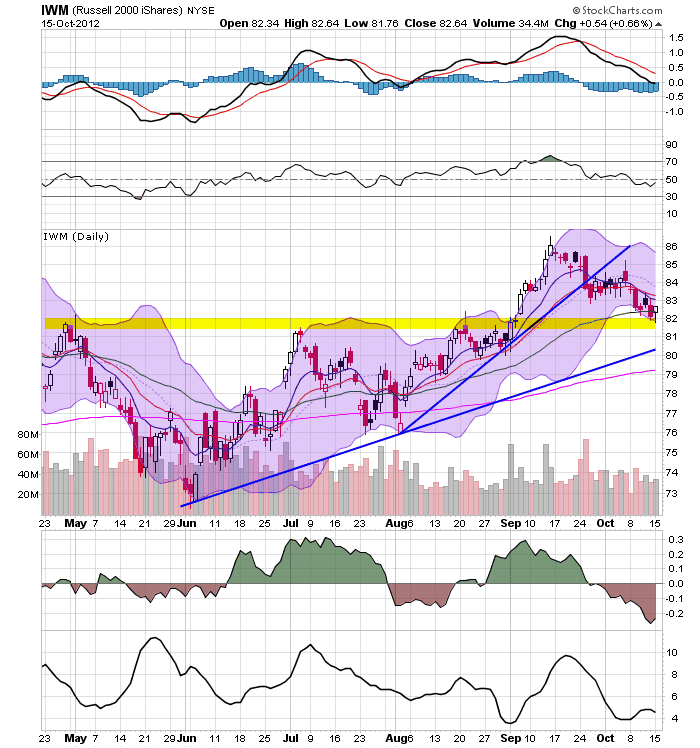 The TED spread continued to fall to year another new 52 week low of 0.22. The one month LIBOR also fell to a new 52 week low of 0.2107. Both are well below their 2010 peaks and in the middle (TED) or low end (LIBOR) of their respective 3 year ranges. The Baltic Dry Index rose sharply again from 926 to 1010, well above its recent 52 week low of 662. 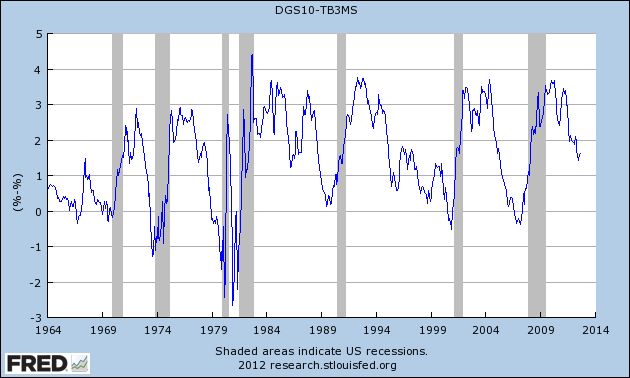 The longer term declining trend in shipping rates for the last 3 years remains. The Harpex Shipping Index fell 2 to 372, however, establishing a new 52 week low. Finally, the JoC ECRI industrial commodities index fell again from 121.63 to 120.96, but it nevertheless was positive YoY. The divergeance between transportation and other indicators lessened this week. While rail traffic as a whole is down, rail ex coal is surging more than ever. The Baltic Dry Index is also rising, although Harpex fell to a new low. Gas usage went positive YoY this week, and the Oil choke collar loosened slightly. Meanwhile housing, bond prices, credit spreads, and money supply all remained strongly positive. People have been asking me for a while to respond to John Taylor’s claim that financial-crisis-induced recessions aren’t characterized by slow recovery. It’s a very convenient claim for Romney/Ryan, of course, because if true it eliminates the best excuse for lackluster performance under Obama. Well, Reinhart and Rogoff, who literally wrote the book on crises and their aftermath, have weighed in, and they’re not happy. They have two main complaints, both of which are completely valid. The first is that looking at the rate of recovery from the trough is a very peculiar criterion — especially when, as Taylor does, you look only at the first year (!) of recovery. By this standard, the New Deal was a tremendous success story, because growth was fast in 1933-4. Never mind the fact that pre-crisis per capita GDP wasn’t restored for more than a decade. As R-R say, surely the relevant comparison is with the pre-crisis peak, especially given the fact that post-crisis economies often suffer periods of relapse (as is happening in Europe now). The second is that Taylor is awfully free in designating recessions as the result of financial crisis. He counts 1973 and 1981 as financial crises, to which the only answer if you know your history is, what on earth is he talking about? These were both disinflation recessions, caused more or less deliberately by the Fed; the Fed pushed interest rates very high to calm prices, and a V-shaped recovery took place once the Fed decided we had suffered enough. This isn’t hindsight: the contrast between those kinds of recessions and the slump following the bursting of a housing bubble was the reason many of us predicted a long, slow recovery well in advance. (It’s been even slower than I predicted back then, but in early 2008 I didn’t realize how bad the debt overhang was). Taylor is, simply put, an idiot. Based on currently available information, the Committee considers the economic recovery in the US to have continued, albeit at a moderate pace, but the sluggishness of economic activities in the euro area to have deepened. Growth has continued to slow in emerging market countries as well, due mostly to the impact of the economic slumps in advanced countries. The Committee expects the pace of global economic recovery to be very modest going forward and judges the downside risks to growth to be large, owing chiefly to the spillover of the euro area fiscal crisis to the real economy and to the possibility of the so-called fiscal cliff materializing in the US. Output growth had remained soft across many advanced and emerging economies, and world trade had grown only slowly in recent quarters. The JPMorgan global composite Purchasing Managers’ Index (PMI) for September had suggested that growth in output and new orders had risen on the month, but those indices also continued to point to below-average growth rates. Members noted that the gradual slowing of Chinese economic growth had been accompanied by declining exports to Europe for some time and, more recently, falls in exports to the United States and Japan. The slowing of growth in China had resulted in weaker demand for steel, which was evident in the falls in steel and iron ore prices in August and had resulted in lower steel production. The Chinese authorities had announced a number of infrastructure projects, although the additional stimulus that this imparted was likely to be modest in the near term. The housing market appeared to have turned but, with prices picking up in recent months, controls on the property market that sought to improve affordability were likely to remain in place, at least in the near term. The slowing of growth in Japan and other parts of east Asia in recent months partly reflected softer global demand, which had weighed on exports and industrial production, particularly for electronic products. Consumer confidence remained subdued across the region. Despite the slowing in economic activity, there had been little recent further monetary easing in the region, apart from Japan. Indicators over the past month suggested that the US economy continued to expand at a modest pace. Members noted that while there had been a few positive developments, growth in important parts of the economy remained restrained. The housing market was improving gradually, with both turnover and prices picking up in recent months. In contrast, labour market conditions remained subdued, with employment growth noticeably slower than earlier in the year. The Federal Reserve referred to this weakness when it announced additional monetary stimulus measures in September. Economic activity in both the euro area and the United Kingdom was continuing to contract amid weak domestic demand, with investment remaining subdued. 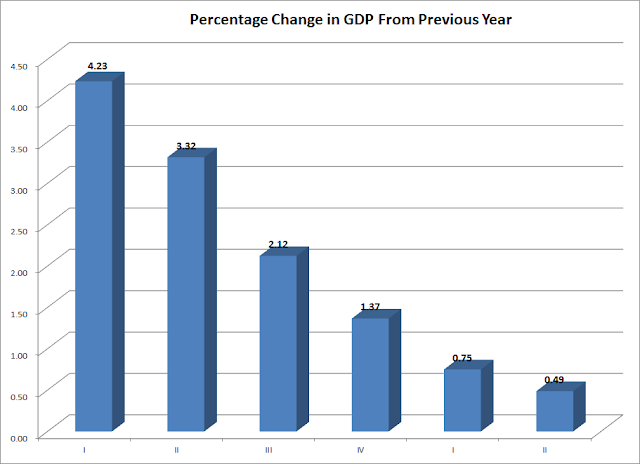 Members observed that growth had slowed even in the better-performing economies. Although some further progress had been made in resolving the banking and fiscal problems in Europe, these problems were likely to present large downside risks to the world economy for some time. 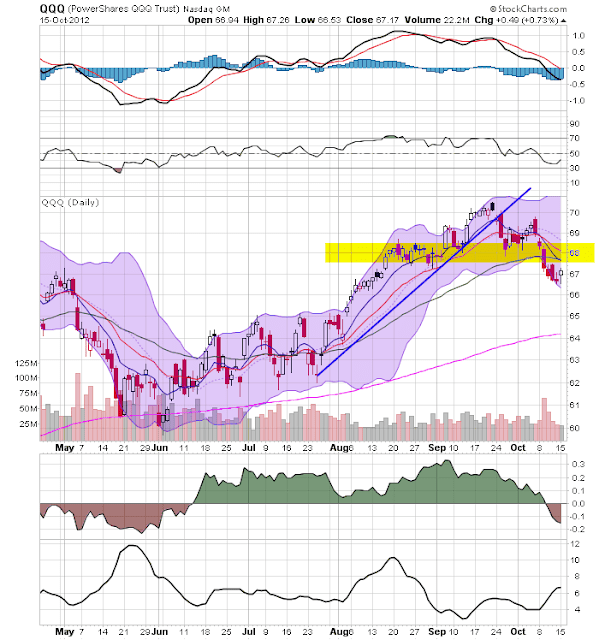 The Chinese market has broken through resistance at the 35.5 level and advanced for the last five days. 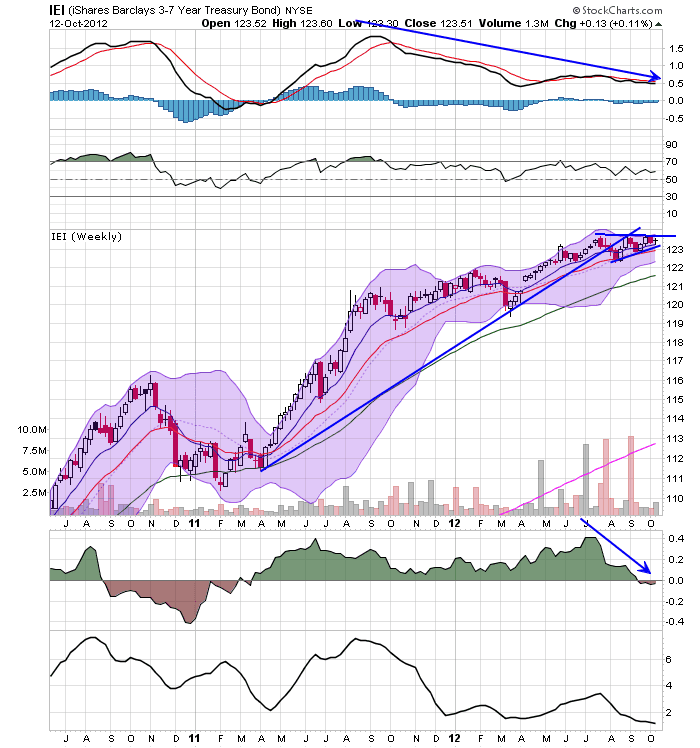 We see a strong MACD picture and rising EMAs. Short-term resistance is right about 37.5. 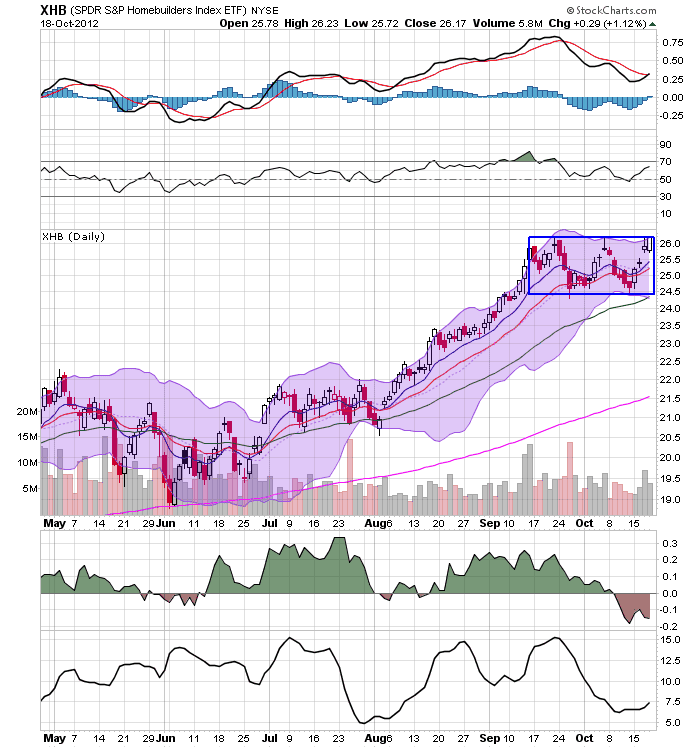 The homebuilders ETF has been consolidating between 24.5 and 26. 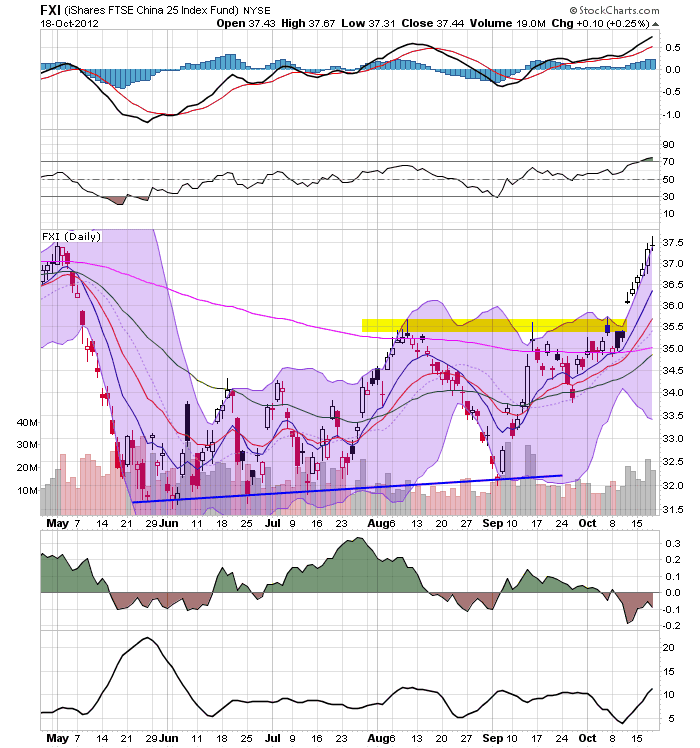 Now prices are right at upside resistance at the 26 price level. The MACD has given a buy signal. 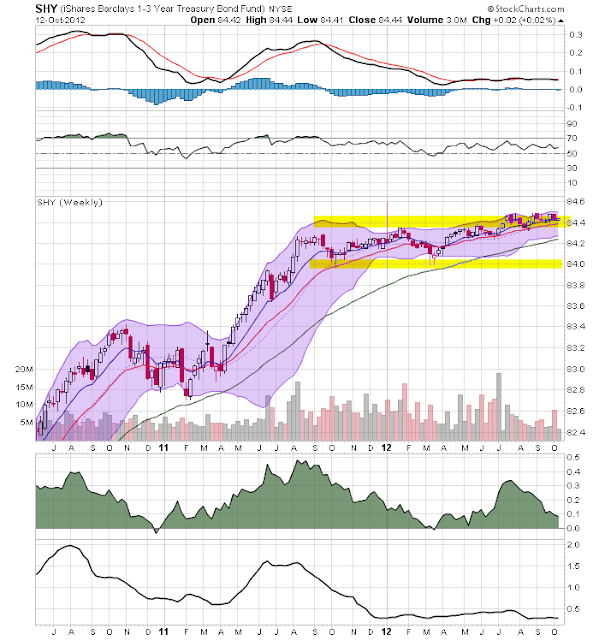 Given the strength of the housing starts news yesterday, this is a sector that stands a strong chance of breaking out. The QQQs are in the middle of a downward sloping consolidation pattern. Prices rebounded to the 61.8% Fib level of the mid-September-mid-August sell-off before moving lower. 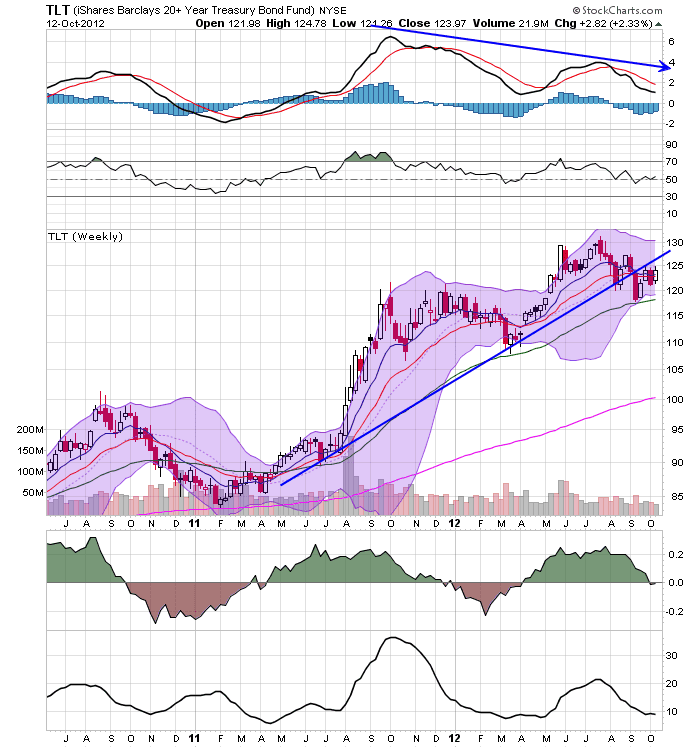 Notice the increase volume yesterday along with the bearish MACD reading. Finally, prices tried to advance over the 50 day EMA and couldn't maintain their strength. 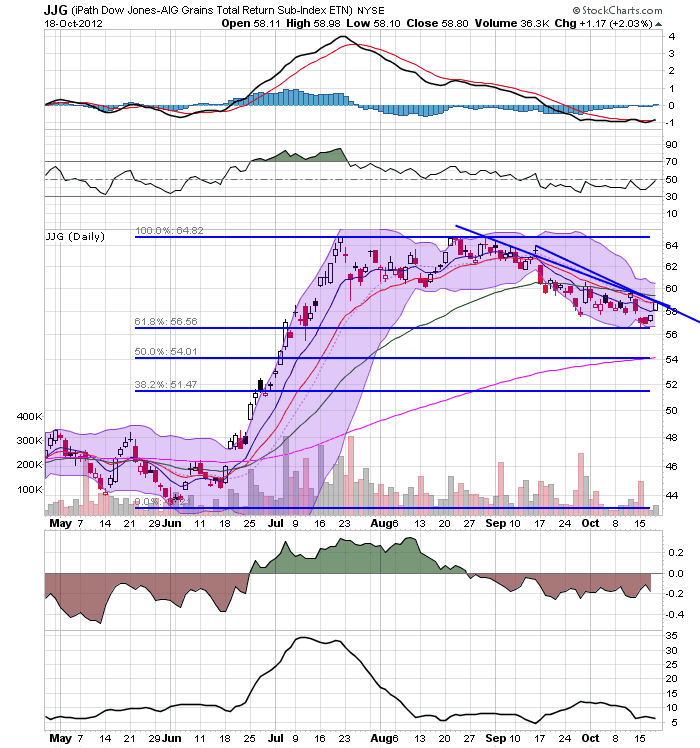 The grains ETF has sold off to the 61.8% Fib level over the last few months. However, prices yesterday placed them right at the edge of breaking through upside resistance. This potential move would jibe with the MACD which is about to give a buy signal. The general trend for the euro over the last three months has been to move higher. But notice this is not a strong rally where price are moving up continually over a period of time. Instead, we have a moves higher followed by consolidation; sharp moves up followed by fairly lengthy moves down. I agree with Bonddad that yesterday's housing starts and permits report the best economic news in a long time. Why? Because housing always leads the economy, and the direction of that lead lasts a year or two into the future. And at this point, the positive trend in housing construction is strongly established. The most important measure of housing construction isn't how much of a recovery there has been relative to the last peak, but how many additional houses are being built now compared with the last measurement period. For example, going from 0 to 200,000 new houses in a year adds just as much new employment as going from 2,000,000 to 2,200,000 new houses. The same amount of new construction workers are needed to build those 200,000 additional houses, the same amount of appliances and furniture will be bought to fill them, etc. Yesterday's data gives us the best YoY housing construction growth in 8 years, and equal to the best growth in over 25 years! This rate of growth in the last 30 years has been consistent with subsequent 4% or even 5% YoY GDP growth, and further consistent with 2% or 3% jobs growth YoY within the next year or two. In other words, the best economic news in a long time. In other words, both the long leading indicator of housing and the short leading indicator of consumer spending are point to an improving jobs picture in the near future. The Copom decided to reduce the Selic rate to 7.25 percent, without bias, with 5 votes for the monetary policy aciton and 3 votes in favor of maintaining the Selic rate at 7.50 percent. Considering the balance of risks for inflation, the domestic activity recovery and the complexity that surrounds the international environment, the Committee understands that the stability of monetary conditions for a sufficiently long period of time is the most adequate strategy to guarantee the convergence of inflation to the target, even in a non-linear way. The following members of the Committee voted for the reduction of the Selic rate to 7.25 percent p.a. : Alexandre Antonio Tombini, Governor, Aldo Luiz Mendes, Altamir Lopes, Luiz Awazu Pereira and Luiz Edson Feltrim. The following members of the Committee voted for the maintenance of the Selic rate at 7.50 percent p.a. : Anthero de Moraes Meirelles, Carlos Hamilton Vasconcelos Araújo and Sidnei Corrêa Marques. The October Copom Minutes will be released in Portuguese next Thursday, October 18. Let's take a look at some the macro level data to show why this is happening. The two charts above highlight a central problem. First, the top chart shows the overall level of industrial production while the bottom chart shows the year over year percentage change. To put it bluntly, Brazilian IP has been contracting on a Y/O/Y basis for the last year. 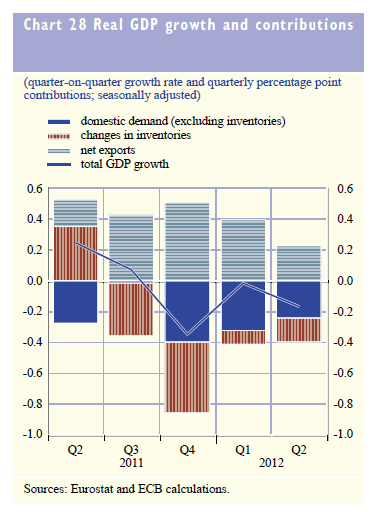 That shows the impact of the overall world slowdown on a natural net exporter. The above two charts of GDP show the central problem. The top chart shows that the quarter/quarter GDP change is very weak which is leading to a drop in the year over year GDP growth (bottom chart). 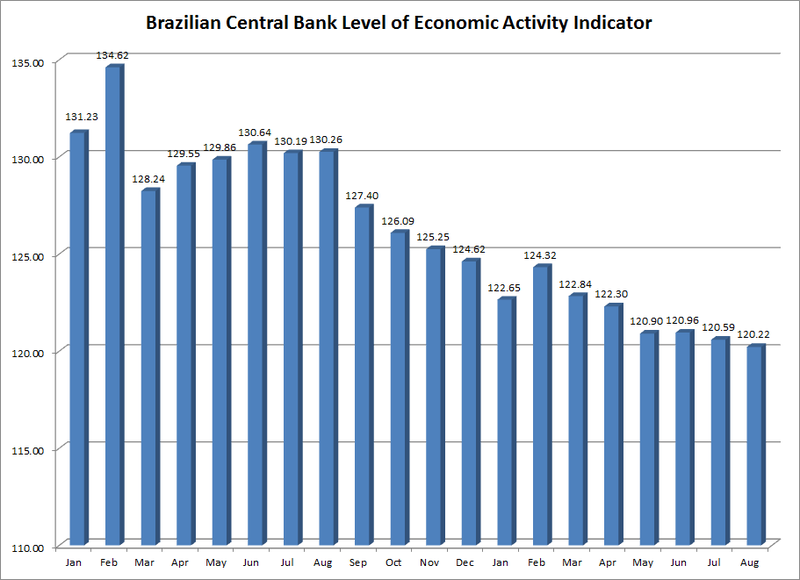 The above indicator is the level of economic activity indicator from the Brazilian Central Bank. Notice that it's been decreasing for a little more than a year. 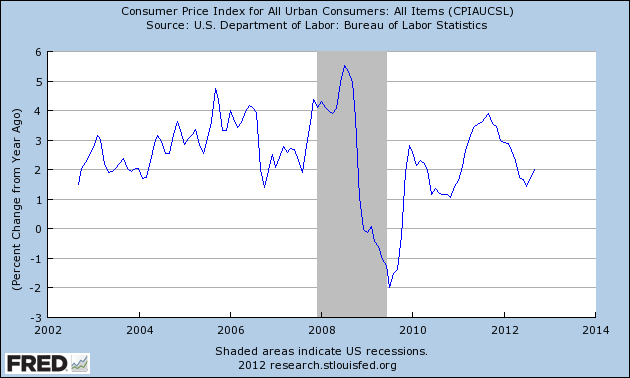 Finally, we have a general decrease then leveling off in the inflation rate, allowing the central bank to lower rates. Brazil is entering a new phase of growth. Up until now, they have grown by selling raw materials (commodities) to China and other up and coming economic producers. However, with China slowing, that is no longer a possible path of growth. 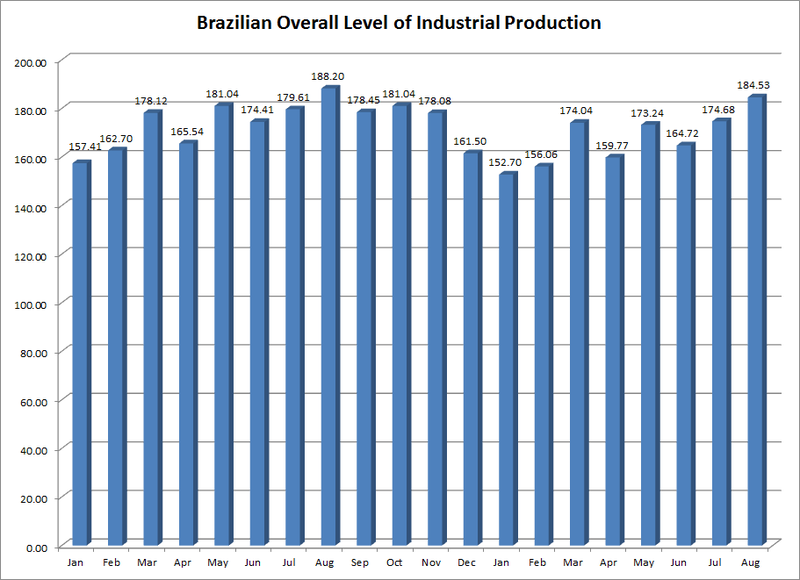 In short, Brazil needs to come up with a new way to expand GDP. First, I'm traveling at the end of this week, so I probably won't have time to post on the markets. However, consider the charts above. 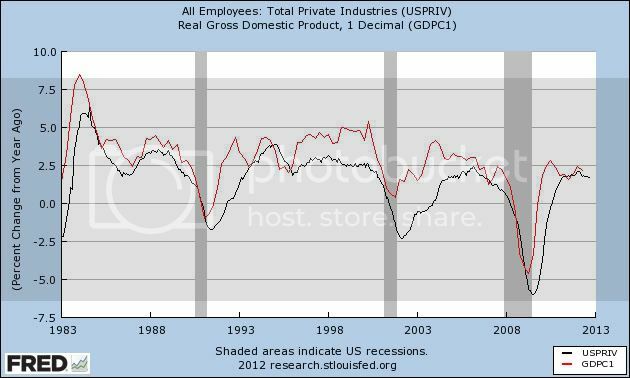 The top chart is CPI and the bottom chart is PPI. Both say the same thing: prices are under control right now. 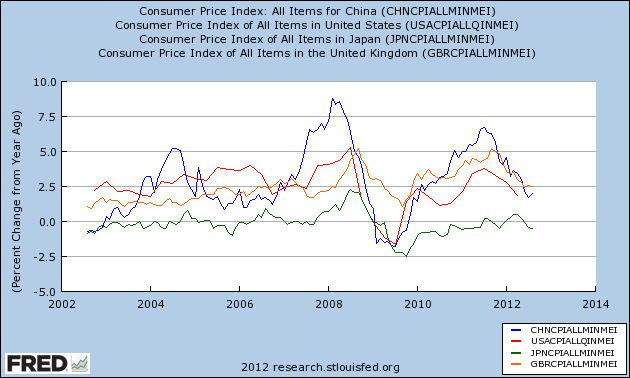 Above we have a year over year percentage change in prices of China, Japan, UK and the US. Notice the we have the exact same situation -- prices are under control. 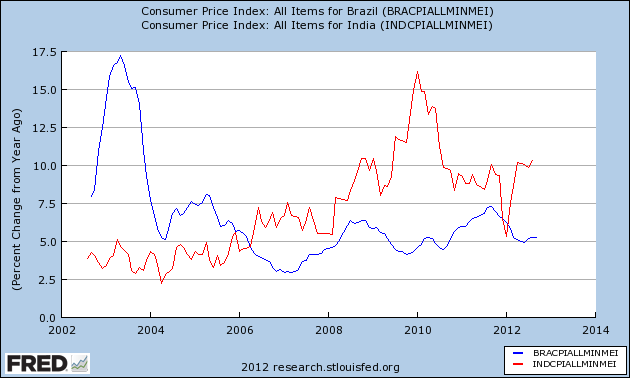 The above graph shows the two markets where we see real inflationary problems: India and Brazil. Yesterday I took a look at rail car loads, noting that once coal was subtracted, rail loads are not just positive, but increasingly so since midyear. But rail car loads are not the only high frequency measure of the economy that have been improving since then. Consumer spending as measured by Gallup, and withholding tax receipts, like rail car loads ex-coal, show the same stall with a few actual negative readings in July and early August, and improving positive readings since then. We saw confirmation of that in yesterday's retail sales numbers for September and positive revisions to August. It will be interesting to see if the rest of September's monthly data as it comes in validates the improvement in the Weekly Indicators I've been charting each Saturday. the revised August estimate of 758,000 and is 34.8 percent (±18.2%) above the September 2011 rate of 647,000. 543,000. The September rate for units in buildings with five units or more was 260,000. A strong residential sector is a key driver of most post-WWII expansions. This is great news. I am deeply concerned about the direction of this country's economy and policies proposed and executed at the national level. For that reason, I think it's important to highlight the extreme problems facing the country in the event of a Romney win in November. First, as of now we know little to nothing about what Obama is proposing. His entire campaign has been about maligning and attacking his opponent. The primary reason for this is his economic record is mediocre. While I understand his "you are better off than you were four years ago" argument from an economic perspective (recoveries from financial crisis are historically longer), this is an argument which is understandably lost on the population at large. Additionally, he suffers from the "I'm a professor, not a leader" mentality which is also quite frustrating. Finally, the Democratic party at large seems perpetually afraid to advance any agenda for fear of starting any type of dust-up within the hard right media complex. However, despite the many attempts to label the current administration socialist, communist or any other such label, the reality is the general political bent of the administration has been center/center-right. We've seen the lowest tax rates in 60 years, banks were bailed out, a mild stimulus was passed which was a combination of tax cuts and spending, and many attempts to work across the aisle were attempted. Agree or disagree with Obamacare, something had to be done regarding US health care. And the plan incorporated bi-partisan points (more on this in a minute). As a result, we're left with a pretty standard post-financial crisis recovery which has seen the US economy expand between 0%-2% for several years. There is no reason to think we won't see a continuation of this general direction over the next four years should Obama be elected. The problem with a Romney win is that we have an idea for what his policies would be. And the sum total adds up to a fiscal and overall policy disaster of the highest order. Let's start with his tax plan. Simply out, it doesn't add up. In fact, it doesn't come close to adding up. First, we have several studies saying it makes literally no sense. A good summation can be found in this Bloomberg Article. Just as importantly, the six studies which supposedly support his plan are, well, a joke (see the same Bloomberg article). Put succinctly, Romney's tax plan makes absolutely no sense. You can't cut rates 20% and then broaden the base to make up lost revenue ground. Not one piece of data supports this claim. The Ryan budget has the exact same problem. When it was first proposed about a year ago, several noted economists dug into the numbers and found them to be bogus (see here, here, and here). Simply put, it, like the tax plan, does not add up. Despite arguing that cutting the deficit is their primary goal, their blueprint to do this is pure fantasy (and please, spare me me the "Romney has said the Ryan plan isn't his plan argument -- it doesn't even pass the smell test). And then there is health care policy. First, the individual mandate (which is a big reason for the dispute regarding this policy) was a Republican idea used by Romney in Massachusetts. In fact, it has been part of Republican orthodoxy for over 15 years. In addition, there are only two ways to solve the health care problem in the US; an individual mandate or single payer at then national level -- those are your options. In other words, Republican opposition is, stupid. More importantly, a complete repeal would harm millions of people who are already benefiting from policies like coverage for pre-existing conditions and allowing children to remain on their parent's insurance. And, more importantly, there is no counter-proposal coming from the Republicans. None. Underlying all of these policy proposals is a basic fact: they don't come close to adding up. This is not a question of a legitimate policy debate where both sides have good arguments to back up their proposals. Instead, Romeny's would blow a bigger hole in the budget and hurt millions of Americans by eliminating their access to affordable medical care. Those are just the facts. And that's where my concern comes from. This confirms what we've been seeing in the Weekly Indicators, especially Gallup's consumer spending, which has improved markedly since July. Since industrial production has not recovered from last month's steep downturn, continuing to suggest that the manfacturing part of the economy is contracting, it is encouraging that consumption has not followed suit (and indeed, usually consumption slightly leads both production and employment). In terms of whether the economy as a whole is still expanding, or is slipping into recession, the real personal income report later this month will take on an added importance. About 1/3 of all goods and materials in the US move by rail. As such, rail traffic is an excellent economic indicator. In fact, before the interstate highway system was built in the 1950's, it was one of the premier coincident economic indicators. There are indications that it is returning to some of that prominence as energy prices improve the efficiency of rail transportation vs. trucking. This is why it is always included in my "Weekly Indicator" columns (particularly as there is no equivalent report by the trucking industry). Recently, depending on how rail traffic is measured, it has either been modestly improving or sinking into deepening contraction. As it turns out, it's all about coal. Coal hauling generally has made up about 20% of all rail loads, and about 40% of non-intermodal car loads. With utilities switching over to other fuels such as gas, the amount of coal rail carloads has been declining. So which is the better measure? There are 20 types of loads reported in the weekly AAR car load data. Coal is one. Of the other 19, none is so large as to dominate the data. Without the secular change from coal to gas in utilities, there is every reason to believe that coal would be in a similar trend as to the other 19 types of carloads. In summary, rail loads ex coal are probably better showing the real economic trend, and that is improvement from a midyear stall to modest growth. The SPYs have broken support and are looking to use the 50 day EMA for technical support. 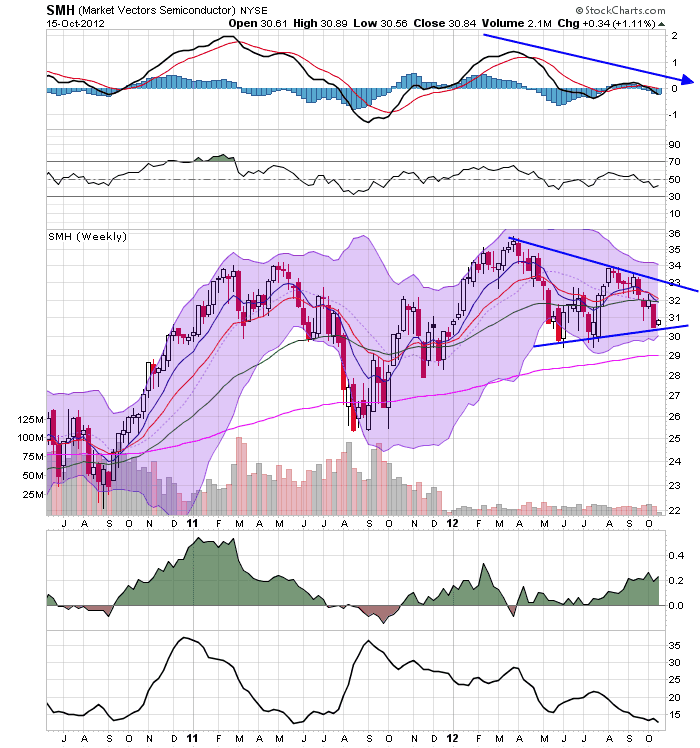 Also note the declining 10 and 20 day EMAs and MACD, indicating the correction is playing out. The negative CMF reading tells us that money is now leaving the market. The IWM sell-off has been going on for about a month. However, prices are still at the 50 day EMA with declining shorter EMAs. But, notice the10 day EMA is now below the 20 day EMA and the CMF is negative and has been for the whole month. The QQQs have also broken trend and are now below the 50 day EMA. The 10 day EMA is about to cross below the 50, but, like the two charts above, the MACD and CMF are reading a contraction. The US equity markets are correcting. There is nothing inherently bearish about these developments; the underlying technicals are playing out like a standard market sell-off. 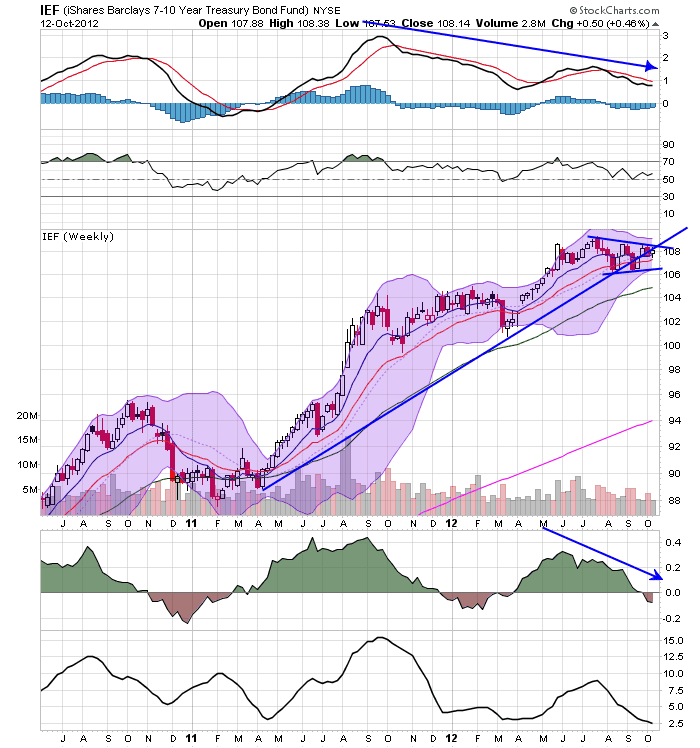 The homebuilding sector has been rallying since last fall. 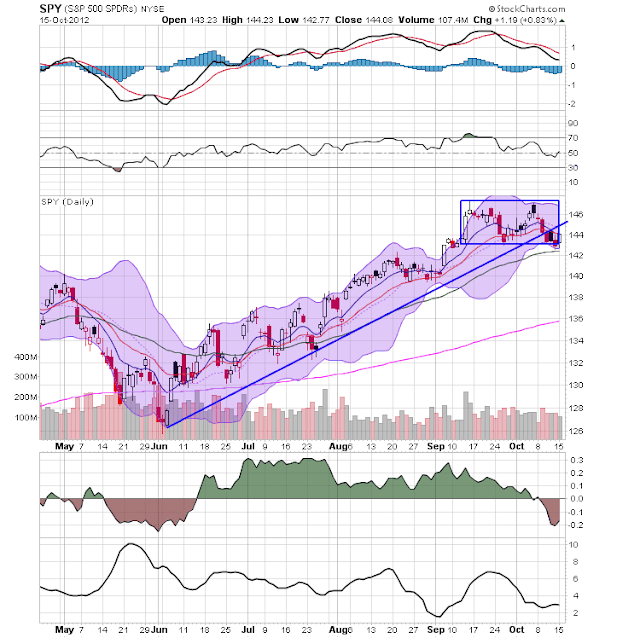 We've see a move higher (through the 200 week EMA), a consolidation down to the 200 day EMA and a second move higher, followed by a move down to the 10 day EMA. Note the big influx of money (rising CMF) since the beginning of the summer. 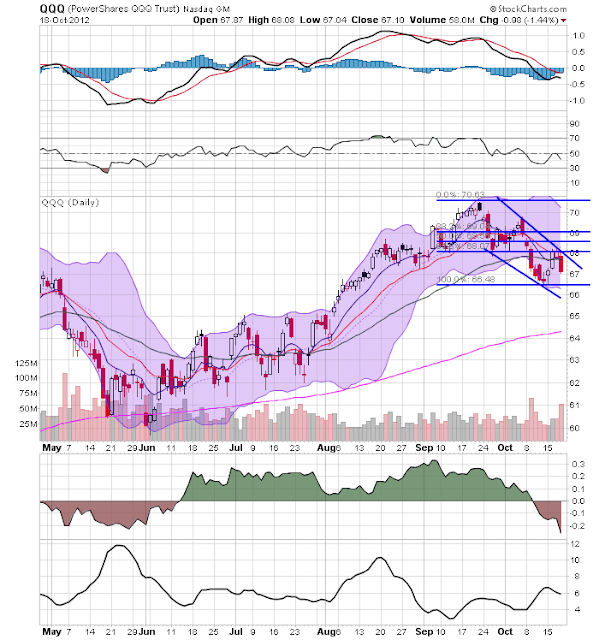 The semi-conductor market is consolidating in a triangle pattern. While momentum is declining, there is a positive inflow of money in a rising CMF. 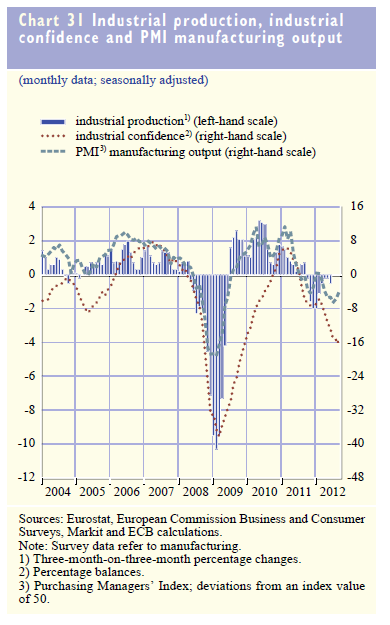 The EU is in the middle of a slowdown. The latest monthly statistical release from the ECB places that slowdown in context. 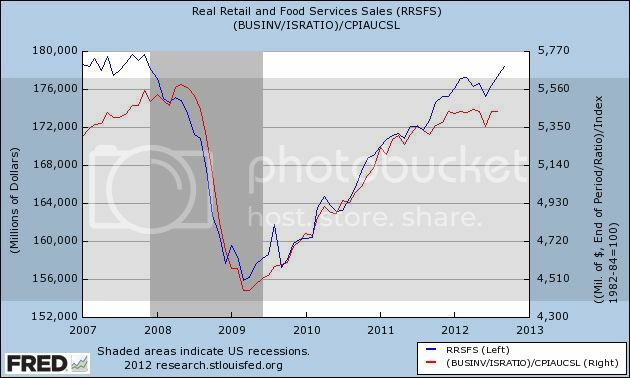 The above chart of retail sales shows that this part of the economy is in trouble as well. 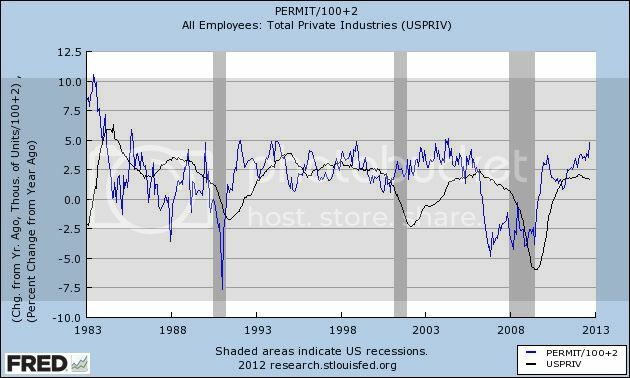 It has been dropping since its post-recession peak and has been negative for the better part of a year. 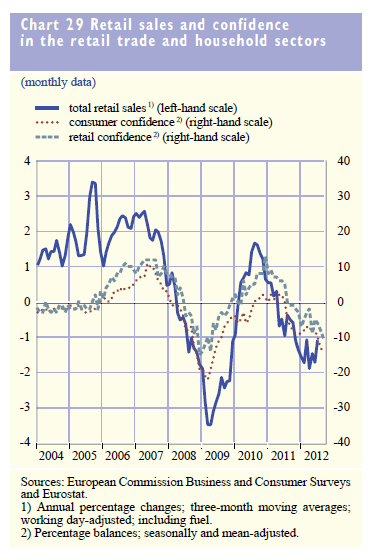 Also note the declining consumer and retail confidence. Finally, there is the industrial sector, which is contracting as well. Also note the very negative reading on industrial confidence, although PMI has rebounded somewhat (from low levels). I'm a big fan of market cycles. What I mean by this is that certain markets will do well during certain economic times. Put another way, the overall trend in certain markets can tell us a great deal about the underlying economic condition in the economy. 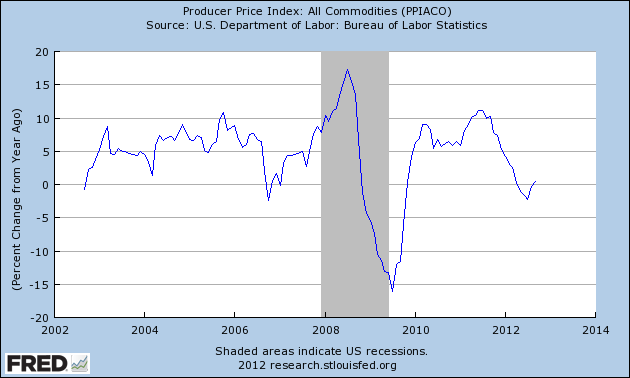 For example, commodity prices typically start rising at some point during the weakest point of a recession. At this time, higher risk traders start to take small positions in goods such as oil and copper in anticipation of increased demand as the economy comes out of recession. Prices continue to generally rise until a point when orders for these goods start to fall or stockpiles start to increase at a rate higher than industrial inputs (this is a situation that is currently happening in China). At this time, traders start to sell their positions or increase their shorts (or some combination thereof). The same cycle is true for stocks, except traders are expecting an increase in profits as the economy expands. The chart above shows the spread between the 10 year CMT and 3-month treasury bill. Notice that this yield compresses as the economy expands, leading to an inverted or very flat yield curve between 12-18 months before a recession begins. Let's consider why this happens. The primary reason why yield curves invert is that as the economy continues to expand the Fed typically starts to raise short-term rates to slow inflation. Obviously, this lowers the spread between the 10 and 3-month bond. 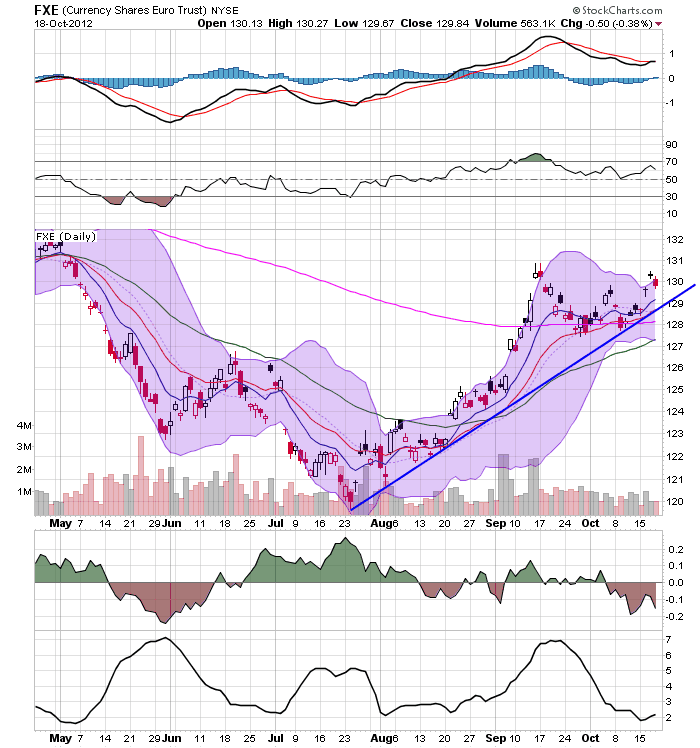 In addition, at some point late in the expansion it becomes obvious that the Fed will start to lower interest rates to goose a slowing economy making all longer bonds currently on the market that much more valuable. For example, suppose the 10 year bond has a face value of 5% when it becomes more and more obvious that the Fed will have to lower rates within the next 12-18 months. That means the 10 year bond will become the highest yielding bond on the market, making it the most valuable. In addition, this occurs at a time with the economy is slowing, lowering inflationary pressures, making bonds that much more attractive. Finally, as the economy slows, interest bearing securities become more attractive because the value of other asset classes (equities and commodities) is more based on economic growth, whereas bonds at least have a fixed coupon amount. In the above scenarios, short term rates are rising and long term rates are dropping, leading to a compressed yield curve. Is the Fed's intervention so extreme as to distort the yield curve in such a high degree that the action is rippling through the markets and distorting all of them in a more than trivial manner? Is money flowing into the treasury market in a large enough degree that the values of the other markets are artificial? For example, should there be more money flowing into the commodity markets in anticipation of rising values? Right now, I have no answer to the above question. It could simply be a theoretical exercise. However, it's something that's been on my mind for some time. Over on the right hand column, you may have noticed a new box identifying this blog as a "Top Economics Site." That's because Economics Degree selected The Bonddad Blog as one of their "Top 100 Sites for Englightened Economists." We're honored to have been included. But we couldn't have done it without you, our readers. Our readership is growing, and our work is being linked to or cross-published with increasing frequency by other economics sites and major aggregators. We're certainly not the biggest blog, but we think that our readership - that's YOU - is particularly high quality and appreciates our no-spin, "just the facts, ma'am," approach. We're glad to be increasingly noticed. So we wanted to say a sincere "Thanks" to all of you.